Fast-forward 7 months, and I was at the eve of my first ultra marathon, knowing that I would be able to finish the GOR 60k. 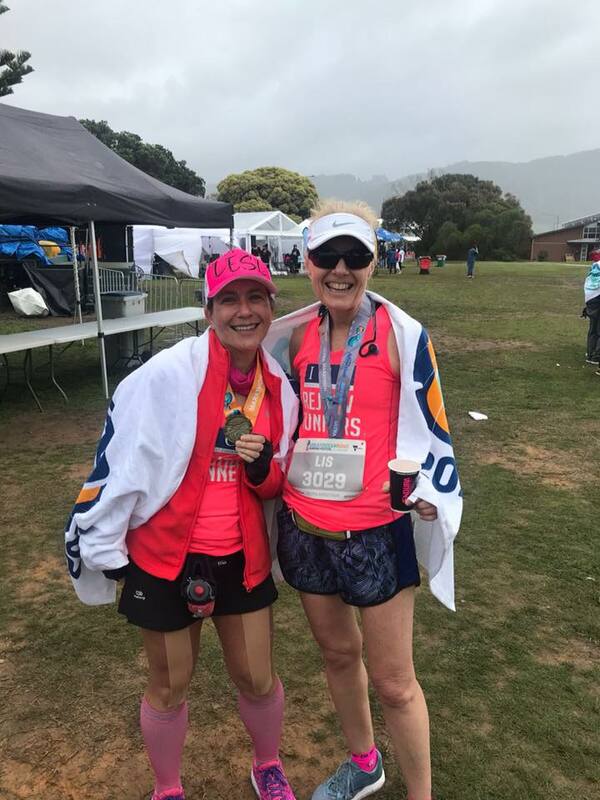 I had put in the training (wonderfully guided and supported by our run coach Greta), completed many long runs (including 3 over 42ks – 43k, 46k and 50k) in some tough humid conditions but had found a new mental strength and a renewed joy in long distance runs, and this gave me the confidence that I could push further. I’d also completed the Canberra Half Marathon as a training run in mid-April and proved to myself how enjoyable ‘races’ can be when you don’t put too much pressure on yourself for that PB. I really wanted to harness this same mindset for the ultra. Plus, I had the never-ending and amazing support of my husband, Grant, who was there with me for many training runs, running an Epsom salt bath for me after a long run or just providing words of encouragement throughout the training and lead up. So the night before the ultra, I was just excited to get to the start line. I had no set time in mind (other than to finish under 6hrs, the GOR has a cut-off of 6.5hrs) and to enjoy the experience, smiling often! I had my gear laid out and was ready for the early start, I just hoped I would get some sleep. Morning of the ultra, I woke before the alarm but felt refreshed. Feeling calm but excited, I went through my normal pre-long run rituals for gear and breakfast and then it was off to Apollo Bay to catch the bus. Grant dropped me at the bus stop and there were lots of people waiting. Both the marathon (44ks) and the ultra start from Lorne so we all got on the same bus. I could only see people carrying marathon gear drop bags or bibs and at this point thought I might be the only one doing the ultra. As we were boarding the bus, a couple of guys behind me saw my bib and commented I was “hard-core” – not sure about that, I laughed and said “this is my first ultra, maybe crazy was a more apt description at this point”. The bus ride was an hour and we were travelling along the exact road we would be running back on. There are lots of twists, turns and hills on the stretch of road from Lorne to Apollo Bay and I was determined not to let all of this worry me. We had driven the road the day before on our way into Apollo Bay so I knew what the race route had in store and reminded myself of this, I was prepared. Once at Lorne, there were the beginnings of day break and again lots of marathoners around. I really was starting to think I was the only person doing the ultra but thankfully found a couple of others as I moved around and did some stretching. A fellow Rejoov Runner, Lesley, was doing the marathon and I keenly looked out for her and we found each other about 30mins before the start. Was so good to see a friendly face and have someone to chat too. The time flew by and before we knew it, we were getting the 5min count to start. As I prepared to cross the start, I reminded myself of my goals – finish under 6hrs, enjoy the experience, smile often and cross that finish line with a smile on my face. This was really important to me that I enjoy the run as otherwise why do these races? Yes it’s about putting yourself out of your comfort zone and challenging yourself to a new distance, new course or a new time, but ultimately it has to be about enjoyment. My plan for the race was to break it down into three sections – 32ks of running on the GOR, about 8-10ks of two really BIG hills, and then a final 10ks of relatively flat running to the finish line. From looking at the course elevation map, I knew the first of the big hills would hit around 32k mark, be about 5ks long and then the second (steeper!) hill would be at the 47ks and cover 3ks. I was nervous about these two climbs but reassured myself I had done the training and would be okay. From the start of the run, I felt great. There seemed to be a lot of us but this quickly thinned out as people found their pace and I had plenty of room to run. The weather was pretty good early on too with a lovely sunrise, cool conditions but ideal for running. GOR is well known for being windy but it seemed okay. I had my music on with a special playlist created from songs suggested by friends and family and that combined with the stunning view along the GOR, my mind was occupied and I was enjoying my first ultra. One thing I did notice was that there weren’t many runners chatting with each other, I think because we were all spaced out and apart from the drinks stations every 5ks or so, there were very few spectators lining the road. This changed at Kennett River which is about the 21k mark and the place where the GOR half marathon (23ks) starts from. Here there were a number of people lining the streets and I asked every kid to high-5 me – I’m sure they thought I was a bit weird but it brought a smile to my face! By this point I had completed quite a few hills with no problem, my training had paid off – but I knew the real challenge was the two big climbs I had coming up in the second half. At the 32k mark, there were two race officials who directed the ultra runners off to a side road to start the first of the big climbs. It was really well organised and they recorded our bib numbers and placed a pink band around our left arms (at the time I couldn’t work out what this was for but later realised it was to confirm we had done the extra 16k distance for the ultra). And so the climb began, I was feeling good and just keen to get through the hill. Half a km up, I started to see some other ultra runners coming back down the hill and everyone was incredibly supportive of each other as we passed which was awesome, really helped to lift you mentally. After 2ks of climb, I started to realise that I had possibly got the elevation map wrong – it wasn’t 5k up and down, it was 5k of up, then a U-turn and 5k back down. Whoops! I refused to let this worry me though, laughed at my mix up and just got on it with it. I decided to do a little walk 250m/run 500m option for 2ks to keep my legs fresh and this really helped. I was pretty happy to see the U-turn though and it was all downhill from there and the next 5ks flew by. Joining the GOR again was made memorable by seeing Lesley doing the marathon – I’ve never heard anyone call out my name so loudly and was such an uplift for me at that point. The next 4ks were spent trying to work out just what I had in store for the next big climb given I’d read the elevation map wrong. I worked out I had a 3k climb that was going to be steeper than what I had just done but on the plus side, it meant that when I had done the U-turn and come back down the hill, I would only have 7k or so left to go. Yah! I have to say the second climb was very steep and not one of the ultra runners I saw was attempting to run it. We all switched to a fast walk and I managed to go past three people. I knew that to finish the run strong, walking up this hill was the best option for me. I was VERY happy to see the U-turn on this hill and to commence the run downhill. I had some great moments on the downhill as I went pass the 50k mark which is the furthest I had run in training, so every km after that was a little mini celebration. I was calling out to every ultra runner passing the other way and providing words of encouragement and support to others really boosted my mental strength and focus. I even managed to sing out loud to a song! I think the guy running behind me must have thought I was crazy. Getting back on to the GOR and knowing I had just 7ks to go was awesome, I shed a tear or two as realised I was going to do this. I was going to finish my first 60k ultra. I had been confident in the lead up but being confident you think you can do it and then actually realising you are going to make it are two different things and the mental strength this gave me was powerful. The last 7ks were tough (the weather had turned during the race and we had a lot of wind, rain, drizzle, cold, wet conditions) but I thoroughly enjoyed it and I have never experienced so much support from spectators as I did on the final 4k stretch. They opened up one side of the road so there was a steady stream of cars heading out of Apollo Bay back to Lorne and all were calling out encouragement. Go Lisa! Go cheer squad Grant & boys!! The spectator support only intensified in the final km. I saw Grant at the start of the final shoot and he was jumping up and down, shouting encouragement and madly trying to take photos all at the same time. Lesley was there too, having finished her marathon and waiting for me to cross the line. And at the very end on the other side of the finish line were my two boys Luke and Rylee. Everyone was yelling and clapping and I couldn’t help but put my hands in the air, wave them like I didn’t care and have a massive smile on my face. Crossing that finish line was an incredible experience and one I will never forget. I had hit my goals and importantly, I had thoroughly enjoyed the run and crossed the line with a smile – I couldn’t have asked for more.